I realize what you probably want is a sourdough bread recipe. I promise to finish that for you by next week! 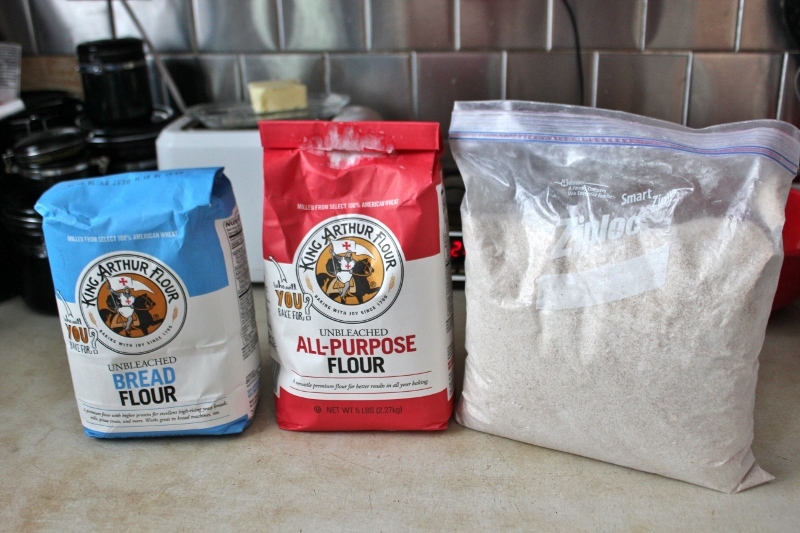 However, before we get to that recipe, I think it’s important to understand the different kinds of flour you can use in your baking and how each flour can affect your recipe. Whole Wheat Flour: I usually use whole wheat flour that we get from a local mill. The miller mills the wheat and then immediately freezes it. After we buy it, we keep it in our freezer. So although not technically fresh-ground, it’s pretty close. Recently I ran out of that, and haven’t had a chance to get any more. Instead, I have been using whole wheat flour from the grocery store. It behaves quite differently, particularly by absorbing much more water. As it turns out, freshly ground flour absorbs less water and so you need to use more of it in a recipe in order to achieve the same results. I have all my recipes fairly finely calibrated for my kind of flour. I’ve had to scale back the amount of flour (usually by around 50-75 grams) when using the grocery store stuff. In the recipes to come, I’ll try to give you a range of weights to use. Start with the lower amount if you are using non-freshly-ground flour and add extra if you need it. White All-Purpose Flour: I use all-purpose flour for making biscuits, waffles, cookies, and generally everything except for bread. White Bread Flour: For years, I considered it too much trouble to keep two kinds of white flour around. My sister-in-law, Meggan, convinced me that it was worth it to also have white bread flour in the house for baking with whole wheat flour. She’s right! Bread flour has a higher gluten percentage so it compensates for whole wheat’s lower gluten and allows you to use less white in a recipe. If you want to bake with whole wheat, you should definitely keep bread flour in your pantry. Just make sure not to use it in waffles or biscuits. They’ll turn out really tough! (I’m speaking from experience here.) Even Ellie knows that “blue flour” is only for bread! See my KIOS post about grains/legumes for more about the flour we buy. Here’s a nice discussion about the properties of freshly-milled flour. Another comparison of freshly-milled vs. store-bought whole wheat. This entry was posted in baking and tagged freshly ground whole wheat flour. Bookmark the permalink.